We are all pretty familiar with Switzerland. It is easy enough to fly to Basle and Geneva from the UK, or go that little bit further to Zurich. Even the tiny capital of Bern is connected to London City Airport. It was because of this unfamiliarity that the well organised Tourism Switzerland chose Appenzell, a Canton entirely surrounded by the Canton of St Gallen, for its annual international tourism gathering. One has to mention ‘well organised’ as it is far from easy gathering over 100 journalists from all over the world to the north east of the country, accommodating them in what is not really much more than a village, and making the five day occasion really worthwhile. 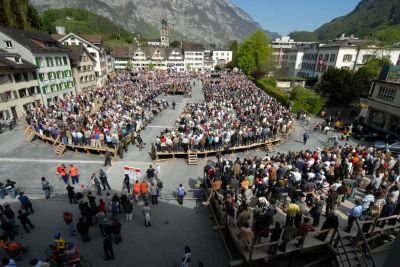 Whilst Appenzell is in the German speaking part of Switzerland (French, Italian and Romansh are the legal languages of the country) such was the mixture that English predominated and was the de facto language of the gathering. The Japanese and Chinese brought their own interpreters along. Appenzell became independent of the Abbey of St Gallen in 1403 and entered a league with the Old Swiss Confederacy in 1411, becoming a full member in 1513. It has been divided since into Appenzell Innerrhoden and Appenzell Ausserrhoden. Catholic and Protestant. It was SWISS airline to Zurich and straight down to the railway station that sits under the main terminal building and then onto the intercity train to Gossau. There a simple change was made to the local Appenzell service. 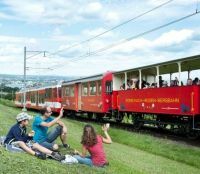 The three-day Swiss Flexi Pass entitles travellers to unlimited First Class travel on railways, boats and most alpine post buses. There is a 50% reduction on privately-owned funicular and mountain railways and free entrance to 450 museums. Appenzell is a delightful Swiss picture postcard mountain village with a car-free high street and a collection of specialist shops, traditional craft workshops, family run hotels and cafés. It is sited 239m above sea level, with the mighty peak of Santis towering 2,500m above. A cable car takes you right to the top, a unique location for a press conference. Eating and drinking was no problem in the summit restaurant and one could see below Lake Constance and Liechtenstein. A remarkable view suddenly engulfed in cloud. Appenzell Innerrhoden is very much an agricultural area, devoted primarily to livestock breeding and dairy farming. The cheeses from this part of Switzerland are legendary. Cow's-milk is used producing a herbal brine, sometimes incorporating wine or cider, and applied to the wheels of cheese while they cure. which flavours and preserves the cheese while promoting the formation of a rind. 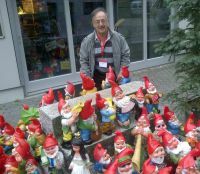 Appenzeller has a documented history of at least 700 years. Today, about 75 dairies produce cheese, each with a different recipe for their brine wash. Most of the recipes are trade secrets. The cheese is straw-coloured, with tiny holes and a golden rind. It has a strong smell and a nutty or fruity flavour, which can range from mild to tangy, depending on how long it is aged. The best is over six months old. You may ask what a hammered dulcimer is? In fact it may have originated in what is today’s Iran and is a popular in Eastern Europe and as far as India. It is a musical instrument with the strings stretched over a trapezoidal sounding board. Appenzell and the nearby village of Herisau is in fact a sort of tiny manufacturing centre for the contrivance. If you want one there is a one year wait, a bit like the Morgan car. They make one a day. 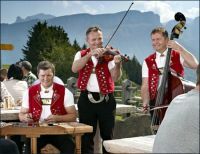 The guests of Switzerland Tourism were treated to a recital by the Appenzell Echo group, cello and violin too. Appenzell has its own tourist card which includes free travel in the region, admission to the major museums, a one time use of the indoor tennis court and swimming pool (there is an outdoor one in the summer), a trip on the Jakobsbad toboggan run and again one time, an electric bike ride. Golf is available too. 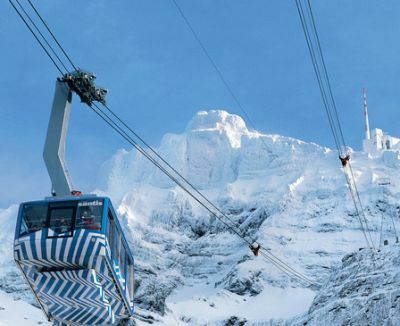 If you fancy the wonderful views there are no less than six aerial cableways in the region, a number of which are included in the Appenzell Pass. For those who prefer hiking some 20 themed routes are provided ranging from just two hours and 10km, to a full day alpine march perhaps staying at mountain hostelry for an overnight. Try the different cuisine (and cheeses). There is also the Joke Trial with the Sondi children’s backpack. There is no other region in Switzerland where tradition and customs are experienced as intensely in daily life as in the Appenzellerland. The locals wear a ‘Kranzrock’ (traditional skirt), cameo jewellery and ‘Mailändertuch’ (Milanese scarf) to perform the ‘Stobete’, the traditional dance with a string music ensemble. As from mid-May the herdsmen, with their local costume, drive their animals to the Alpine pastures. In autumn the most beautiful cows are crowned at the cattle shows. From New Year right around to Christmas there seems to be one excuse after another for a party. Check carefully in the village diary when you want to come. It is silly missing (free) entertainment by the odd day. Appenzell is also famous for beer, and now whisky. The largest independent brewery in Switzerland, Brauerei Locher AG, dates from 1886. This family-owned company has been brewing beer for its clientele for five generations now. Its speciality beers have achieved wide acclaim as have the company’s traditional beers. The beers are made by hand and according to traditional methods with special attention being paid to the quality of the raw materials. Appenzeller Säntis Malt was first distilled in 1999. In 2010, Jim Murray, said to be the world’s most renowned whisky expert, declared Appenzeller Säntis Malt European Whisky of the Year. In recent tastings Appenzeller Säntis Malt has been beating Scottish whiskies. The whisky is aged in old beer barrels and distinguishes itself for its caramel and honey flavours.